Too often are really functional bags horrible looking. To remedy that, the team over at Tumi have put a lot of effort into crafting quality, durable carry on bags that actually look great. These are bags that you would proudly wheel into a business meeting when coming straight in from the airport. In this Tumi Alpha 2 Continental review we explain why you really can’t find a better quality bag that also has a lot to say about style and aesthetics. The Tumi Alpha 2 Continental spinner carry on is the kind of bag that really is the full package. It looks great, is well organized and offers a few bells and whistles that will make business travelers very happy. The Tumi Alpha 2 Continental 4 wheel spinner is a rare beast that combines best in class quality and slick looks that would be the envy of any businessman or world traveler. Tumi’s unique use of materials and fantastic organization overcomes a slightly smaller inside capacity to create one of our favorite carry-on bags in recent memory. This is a great sequel to the original Tumi Alpha carry on bag. While you pay a bit more for the Alpha 2 compared to, say, the TravelPro Magna 2, you really get a lot for the extra cost. The Alpha 2 is made of 100% ballistic nylon, making the bag extremely resistant to rips, scuffs and any other damage. And the telescopic pull handle is made from aircraft grade aluminum which lowers the weight on the handle while still remaining incredibly rigid and resistant to scuffs and scratches. All of the corners of the bag are covered in bumper armor so you won’t have to worry about throwing the bag around into the overhead bins. This bag is also available in an international size as well as a two wheeled “roll-aboard” style. They each have the same quality components. 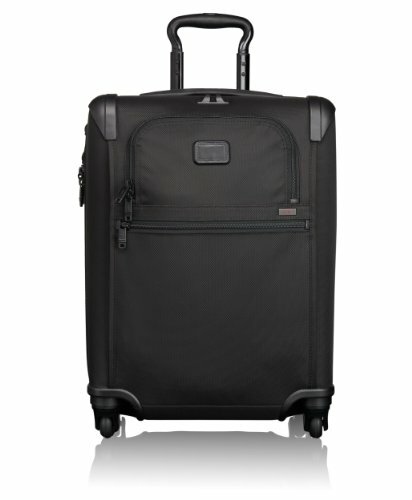 The Tumi Alpha 2 spinner uses some really great wheels (as with most Tumi bags). What we like about these wheels is how they are recessed into the frame of the bag. Because of this, they are much less likely to sustain damage from bumps along your travels. We’ve tested many Tumi bags over the years using these same double recessed wheels and we can safely say that they are top class designed wheels. For a carry-on size 22″ x 16″ x 9″, this bag has moderate carry capacity. It isn’t the best in the world but it really overcomes this by having some of the best included organization in the business. It includes a suiter zip pocket in the lid of the bag so you can be sure to arrive at your destination with a nice wrinkle-free suit jacket or pair of pants. The bag is a great clamshell design which has a full zippered pocket on one side. This is pretty standard nowadays but Tumi executes it very nicely. The zippers on all of the pockets feel substantial and move easily without snags. Rounding out the package is a nice set of compression straps to keep everything nice and stable inside the bag. As with all Tumi bags, the Tumi Alpha 2 Continental includes their proprietary Tumi Tracer ID system for identifying your bag in the event of losing it. It’s a nice premium feature that makes you feel just a bit safer with this bag. Liking this Tumi Alpha 2 Continental review? We recommend that you check out our other luggage and travel gear reviews. Tumi’s warranty is pretty good. It’s not in the same ballpark as Briggs & Riley’s ridiculous lifetime warranty, but it does cover it for any damage (including airline damage) in the first 12 months. After this time period, it reverts to a normal wear and tear and manufacturer defect warranty that isn’t much different than anything else on the market. Still, that first 12 months is welcome. This bag is a bit expensive but we think that you get a lot of value for this cost. We’d put the Alpha 2 in the same category as the Briggs & Riley Baseline carry-on in terms of quality and price. Tumi Alpha 2 Continental review round-up: Should I buy this bag? If you are someone who loves really well crafted bags made from quality materials you can’t go wrong with Tumi. We’d argue that this bag is probably one of the best looking standard carry-on size bags around, adding a but more style than the top bags from other companies.